Here’s a great Easter story I shared on my blog SIX years ago (back in the stone ages before Twitter and Pinterest) called Naked Jesus, Mr. God, and the Easter Bunny. We went to church last night which may be our new Easter weekend tradition as we were able to sleep in while the Easter Bunny worked his magic. Today we are visiting my mom and my inlaws and the girls will get sugared up at their annual egg hunt with their boy cousins. What are your plans for the day? If you have any extra Cadbury Creme Eggs, send them my way, OK? 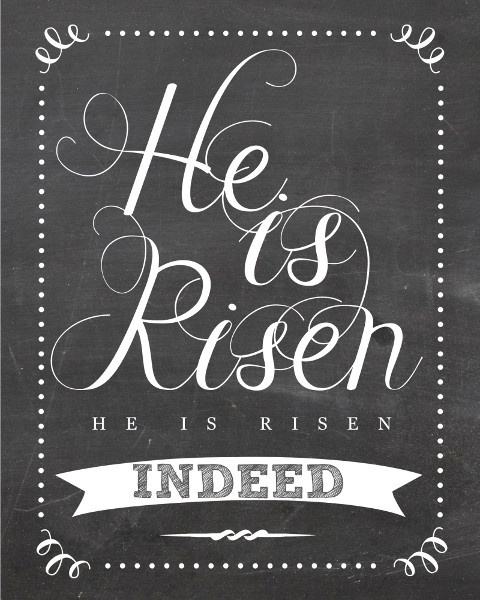 This entry was posted in My Girls and tagged chalk board, Easter, Easter 2013, easter bunny, Happy Easter, printable.